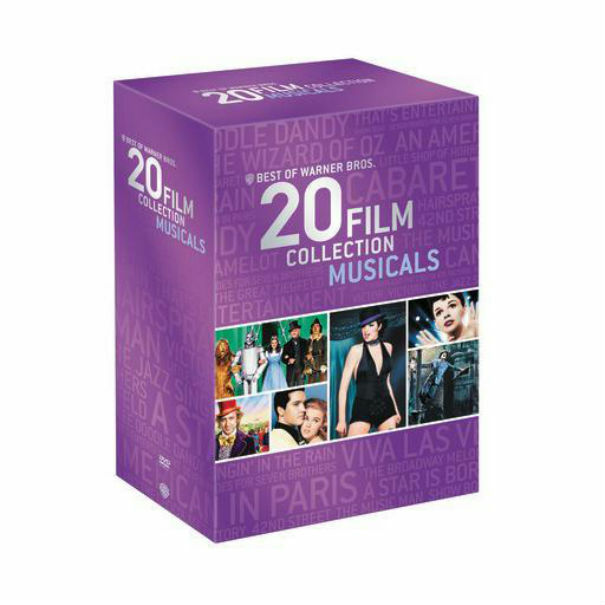 DVD Review: "Best of Warner Bros. 20-Film Collection: Musicals"
Warner Brothers continues celebrating of its 90 years of producing and acquiring films with this collection of significant movie musicals. Warner Bros. continues celebrating of its 90 years of producing and acquiring films with this collection of significant movie musicals that span the history of “talking” motion pictures. Whether or not the makers of this fine collection intended to or not, they have also provided a unique overview of the evolution of the movie musical, a genre that continues to grow to this day (see Les Miserables). The collection begins with the first successful “talkie,” The Jazz Singer from 1927. This box office hit stars Al Jolson, then one of the biggest stars in entertainment, as a singer who left his parents and Jewish heritage to become a star. It’s essentially a silent film with segments that allow for songs. In fact, the only time you hear people speak in this influential film is either through singing or in between numbers (which is when Jolson famously says, “You ain’t heard nothin’ yet”). If you can get past the socially accepted racism of the film, it’s worth seeing. With the success of The Jazz Singer, Hollywood studios raced to get out the next talking motion pictures, capitalizing on the “new” technology (funny how little has changed in the movie business). In addition to finding ways to make sound equipment mobile, the studios also began incorporating more songs into movies. The Broadway Melody from 1929 shows how far movies advanced in just two years. Set in the world of Broadway musicals, it is a musical drama about two sisters trying to get their big break on the Great White Way. One sister is brainy and has a belly full of fire, the other a blond bombshell. You can figure out which one gets all of the attention. The Broadway Melody was a huge hit in its day, earning $4 million at the box office (admission price was 35-cents, so that’s a lot of quarters and dimes) and it went on to win the Academy Award for best picture the year it was released. Broadway proved to be a good source for material when it came to movie musicals, as many of the earliest films dealt with the ins and outs of stage plays. 1933’s 42nd Street has all of the hallmarks of what would become typical stage musical plot: The dewy eyed ingénue, the stuck up stars, the hard up producers, shady ladies, and the cruel directors and choreographers. What 42nd Street has that so many films that have followed do not is the sensational numbers done by Busby Berkley. Elsewhere on this collection, Florenz Ziegfeld’s life and his legendary Follies are portrayed in 1936’s The Great Ziegfeld (starring William Powell as Ziegfeld) and James Cagney stars in his Academy Award winning role as song-and-dance man, George M. Cohan in 1942’s Yankee Doodle Dandy, directed by Michael Curtiz. Musicals eventually moved away from Broadway and found creative ways to incorporate songs into the heart of movies. The Golden Age of movie musicals is represented by some of the most wonderful films of all time. The Wizard of Oz (1939), one of the most beloved films of all time, Singin’ in the Rain (1952), considered by some to be one of the greatest films ever made, and The Music Man (1962), the joyful hit starring Robert Preston are all here. Each is remastered, with the audio cleaned up and the colors popping off of the screen. At the same time these great films carries the torch of the traditional movie musical, other films in the genre began to experiment, pushing the boundaries of musicals and cinema. An American in Paris, the collaboration of Gene Kelly, producer Arthur Freed, director Vincente Minnelli and screenwriter Alan Jay Lerner, combines impressionistic set design with modern dance (thanks to the mastery of Kelly) all set to the music of Gershwin. Made in 1951, it broke new ground in the movie musical genre. Show Boat, from 1951, appears to be your standard Broadway adaptation; however the message against racial bigotry was risky in that era. Likewise, Seven Brides for Seven Brothers (1954) has the makings of a typical studio musical, yet Stanley Donen’s use of the wide screen as an artistic tool for showing off Michael Kidd’s wonderful choreography make it an influential film in the years to come (see Robert Wise’s The Sound of Music and West Side Story). Not all musical were happy affairs. 1954’s A Star is Born, presented here in its reconstructed length, is a dark look at show business and how fragile egos can destroy a man or a relationship. Judy Garland stars as a talented singer whose career is on the rise. She catches the attention of James Mason’s alcoholic actor, whose own career is taking a nose dive. Their affair is intense, and only one of them will survive the backstabbing and short memory of Hollywood. Both leads are unforgettable in this film, with Garland showing a fragility that must have come from her own experience. With the advent of rock ‘n roll, the movie musical shape shifted, as rock music found its way into movies. While this meant a lot of silly Frankie Avalon and Annette Funicello movies, it also meant some fun, and sometimes great, films by Elvis Presley. He’s represented in this collection by 1964’s, Viva Las Vegas. It’s one of the King’s most popular films, with great tunes, fast cars, and Ann-Margret’s gyrating hips and breasts to drive every young man (and Presley) wild. This collection comes in three 7-disc sets, each categorized by years. Set one is 1927-1951, set two is 1951-1964. The third and final set, 1967-1988, is also the most eclectic of the bunch. It begins with Camelot, from 1967, which marks the tail end of the big budget, Hollywood musical. This tale of King Arthur and his knights of the round table, gave Richard Harris one of his most famous roles. As the cynicism of the 1970s grabbed hold of popular culture, musicals fell out of the public’s favor. However, that mood of that era came across in the sometimes touching, sometimes very creepy Willy Wonka and the Chocolate Factory. This movie, based on Roald Dahl’s Charlie and the Chocolate Factory, stars Gene Wilder as the titular character, a man with many secrets and not afraid to put kids in danger. Some acclaimed directors took stabs at the genre and began to retool it for a new generation. Cabaret, the nihilistic musical comedy that starred Academy Award winners Liza Minnelli (daughter of Judy Garland and Vicente Minnelli) and Joel Gray, featured the music of John Kander and Fred Ebb, and was directed by the incomparable Bob Fosse (he also won Best Director for the film) showed that the musical could adapt with the times. MGM responded to the cynicism of the 70s with a documentary about its long legacy of movie musicals. As Frank Sinatra states in the opening minutes, some studios may have been known for gangster films, others for horror, but MGM was known for their musicals. That’s Entertainment, released in 1974, is a star studded loving tribute to the studios storied history. Gene Kelly played a key role in recruiting major stars to appear in the film. It proved to be the last time film footage was shot on the MGM lot. Soon thereafter, the studio was razed and the land sold for housing. A part of film history reduced to rubble and dust. Thankfully, the films live on forever. Into the 1980s, musicals began to taper off, most likely because of their cost. Still, some got made, including one of Blake Edwards’ career bests. 1982’s Victor/Victoria was a gender bending musical comedy that was a critical and box office hit. It starred his wife Julie Andrews and Robert Preston. They have a grand old time in this film that deals with homosexuality and sexual identity. James Garner is also splendid in this great treasure from the 80s. Another film that seemed destined for greatness is Frank Oz’s 1986 adaptation of the off-Broadway hit, Little Shop of Horrors. Starring Rick Moranis, Ellen Greene, Victor Gardenia, Steve Martin and the voice of Levi Stubbs (as a man eating plant), Little Shop of Horrors is darkly funny, even if the director was forced to change the original ending to something happier. The film is significant because it brought the songwriting team of Howard Ashman and Alan Menken to Hollywood. The duo would go on to write some of the most popular animated musicals for Disney in the late 80s and early 90s. The last film in this collection is Hairspray. No, not the John Travolta spectacle, a box office sensation in the past decade, but the 1988 original John Waters cult film. Sort f a hybrid of underground filmmaking and he kind o rock and roll film that made Elvis popular, Hairspray shows how far musicals came from 1927 to the late 80s. Each of the DVD’s in this collection come with plenty of bonus features, most of them audio commentary tracks by historians or the filmmakers. Some of the vintage films also contain film shorts from their respective eras, which are always a pleasure to watch. Since I was not able to preview the Blu-ray edition of this collection, I’m not sure if the discs for Cabaret and Little Shop of Horrors are the most recent remastered versions. As my friend, Bob Cashill, recently reviewed, the new Cabaret Blu is spectacular. And the Little Shop of Horrors Blu released last year contains the original (bleaker) director’s cut. Still, this is a nitpick. This collection is an excellent addition to anyone’s library, and a fine representation of the history of movie musicals.